Poha is easy to cook and is highly nutritious as lots of veggies can be added to it. Poha is a staple breakfast in many Indian households. Kanda Poha is a popular Indian food from Maharashtrian cuisine which is served for breakfast or snack. Kanda Poha is prepared using Flattened or Beaten rice which is available in variety of thicknesses. It has subtle variety and strong flavours which varies from region to region. Regular consumption of Kanda Poha can prevent anaemia as well as iron deficiency since it is loaded with iron. Every 100 g raw rice flakes contains 19 mg of iron. Our body needs iron to form haemoglobin that carries oxygen to body cells and boosts immunity. 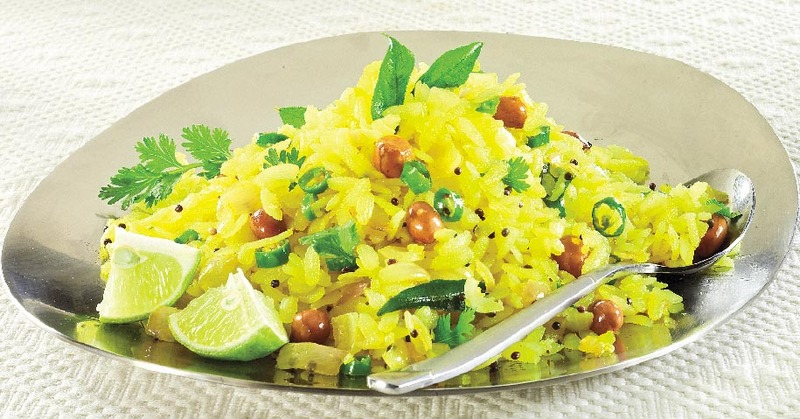 Squeeze a Lemon on Kanda Poha as it improves iron absorption. Kanda Poha is a complete meal as variety of vegetables can be added to it which makes Kanda Poha rich in vitamins, minerals and fibre. To prepare a highly nutritive and protein rich Kanda Poha, you can add boiled eggs, soya chunks, peanuts and sprouts. Beaten rice from brown rice can be a healthier option. Poha is a rich source of Carbohydrates which makes it a perfect breakfast option. Getting carbohydrate intake from a healthy snack such as Kanda Poha is very important. Poha is low on gluten and it is also considered to be a great meal option for diabetics as it promotes controlled release of sugar into the bloodstream. It also keeps tummy full for longer time. Make Kanda Poha tasty and nutritive by incorporating vegetables and different ingredients. A very healthy and popular breakfast option, Poha is common in Maharashtra. Previous articleHow Many Calories Are There in Chole Bhature & Does It Have Any Health Benefits?